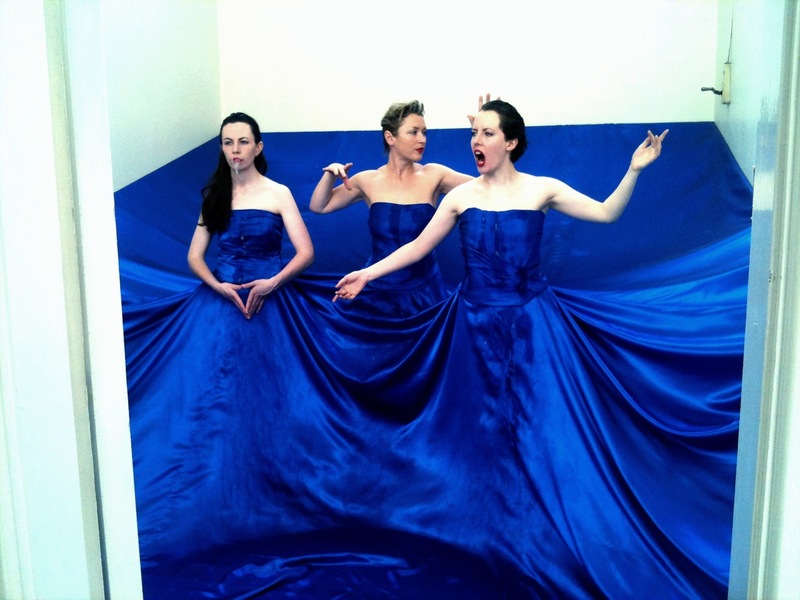 Amanda Coogan is a visual artist who makes live performance art. She works from her studio at her home in Dublin. Originally, she studied traditional painting in Limerick School of Art and Design but said that her transition to performance art happened very organically. The fact that she was brought up through sign language was a very important factor as it was natural for her to communicate using her body. Amanda says that performance art is a very particular experience, both for the artist and the audience. There is an immediacy to the work that must be experienced first-hand; the audience embody the experience and breathe the same air as the performer. There are thousands of photographs that document Amanda’s live performances but she doesn’t show documentation as work. She says that if you look at documentation of a performance, you are missing something. There is an intimacy for the audience with performance art that does not come with looking at two dimensional works. It seems that there is amazing stamina involved in being a performance artist and I asked Amanda how she stays in control of her body throughout her durational performances. She said it’s not that she has extraordinary bodily strength but that there is an endurance and a commitment that are essential in order to make a durational performance. When she immerses herself in a performance she relinquishes every day time. There is a significant relationship built between the viewer and the live performance artist. Amanda says that to “deny that humanity is to miss a huge chunk of what a live performance actually is”. A recent work Amanda made, entitled The Passing, was a 24 hour performance commissioned for the opening of a new wing of contemporary art at the Museum of Fine Arts in Boston. She described it as a “soft but physical” performance. 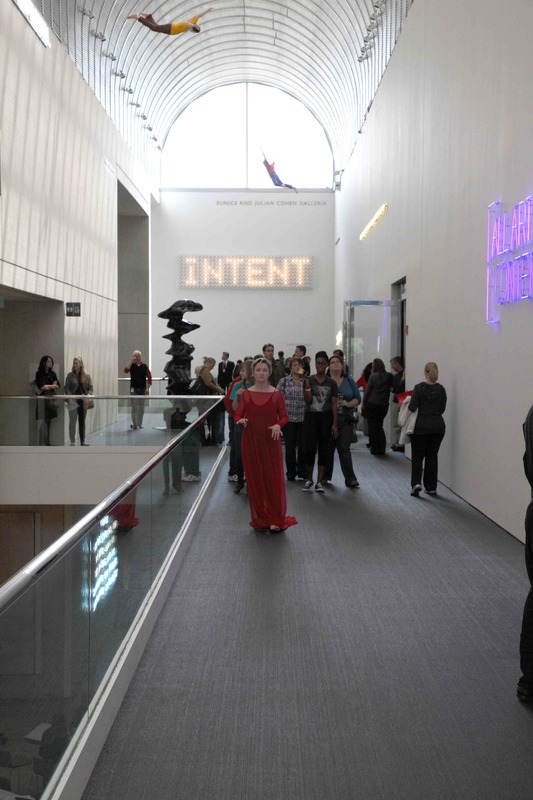 It involved walking up and down the stairs of the gallery for 24 hours in a long red dress. An everyday activity, but when done for this amount of time Amanda said it becomes something quite different. The performance was done as part of the opening weekend where Christian Marclay’s The Clock, a 24 hour looped video, was being shown so the museum was open for a full 24 hours. She said that at some stages of the performance she did struggle quite a lot. She then added that everyone goes through moments of struggle with different art forms but because performance art happens to have a very intense time frame around it, because it is made in public in front of an audience and because it is a bodily experience, the struggle can sometimes be visibly perceptible. During the performance she found that she could control her body – it continued to move up and down the stairs – but her mind began to hallucinate. This made her feel out of control and she continuously grounded herself by making eye contact with the audience. As part of this piece Amanda is collating some text about the performance which offers an insight into her process and experience of the work. She describes a moment during the performance, about 18 hours in, when she is finding it very difficult; “I decide I might be able to do the eye gaze. I pick a young man near Mari. It’s electrifying. I look at him. He’s scared. I slowly blink meaning ‘I’m nice don’t worry’. He’s so beautiful. I’m breathing him in and out. We stay like that for a while. It refreshes me. It’s better than honey or water.” Honey and water were the only sustenance Amanda allowed herself during the performance. The clothing Amanda wears for her performances are integral to the work. She has clothes tailored to the exact needs of each performance whether that need is to show her body in a particular way or to use the dress as a tool in the performance. She says that because of certain ways she uses the clothes they keep her grounded and alert. In her recent piece Spit Spit, Scrub Scrub, made for Dublin Contemporary 2011, the clothing was really important to the work. It was essential that the material of the dress took over the whole room as it was inspired by the story of St. Bridget: St. Bridget was told that she could have all the land her cloak could cover to build her convent, so her cloak magically spread out over acres of land. Another important aspect of this piece was the music. As Amanda was not performing herself every time she said she wanted it to have some sort of structure for the performers. When the work began to form, Amanda was living in Manchester and she recorded the noises of the train journey from her flat to the theatre where she was working. She said that Merce Cunningham, the famous dancer and choreographer, used to say to his dancers that during a performance, to open up the energy, they should visualise themselves on a train on a track that goes on to infinity, goes through their body and back to infinity. This is why Amanda chose to include the audio recording of the train journey. She layered this with sounds from nature and dropped in fragments of music. When I met Amanda she was working on editing a film that incorporates video recordings of six separate live performances done by six different women, including Amanda. These performances are part of her yellow series and were done in St. Mary’s Abbey, Dublin, in 2010. The film will show the screen split into six, each section showing a woman wearing a long yellow dress that she continually washes over a period of four hours. “The ritual of repeatedly submerging and scrubbing the fabric they wear becomes an act of cleansing and rebirth”. The film will show the same time frame of each performance side by side. At some stage during hour three, Amanda said that all of the performers have a moment of struggle and this, for Amanda, is a highlight because it’s something they must come through and the audience members witness this happening. It forces people to confront their physicality and humanity. The film is the same duration as the four hour performances because she did not want the durational aspect and the endurance of the live performances to get lost. It was premiered at the Jameson Dublin International Film Festival this year.